Blueberry Pie Recipe made with frozen wild blueberries, sugar, butter, tapioca and flavorings in an old fashioned Flaky Pie Crust. Wild Blueberries contain more antioxidants than those cultivated. You can use cultivated blueberries here. Being one of the most valuable antioxidant super fruits, they contain Vitamins A and C, Calcium, Iron and Potassium. This is an adaptation of a County Fair winning recipe that I received years ago. This pie is not as sweet with less calories. I added a hint of vanilla to enhance the flora of the wild berries. Remove blueberries from freezer and place in a medium size bowl. Stir in the 1/2 cup sugar. Cover bowl to slightly defrost berries at room temperature while you mix the pie dough. Mix pie dough together and place in refrigerator as directed. Sprinkle lemon juice and tapioca over blueberries in bowl and mix well. Cover and set aside for at least 15 minutes. After 15 minutes remove pie dough ball from the refrigerator and roll out per instructions. Place bottom crust in a 9" pie pan. Trim edges. Stir melted butter and vanilla into blueberry mixture. Spoon berries over bottom crust. Carefully place second crust over berries. Trim crust leaving enough crust to tuck edges under the edges of the bottom crust. Use the method of sealing you prefer. Prick several places towards the center of the crust to allow steam and juices to escape, without boiling over in the oven. To add the glaze brush top of crust lightly with milk or cream and sprinkle with the 1 tablespoon of sugar. 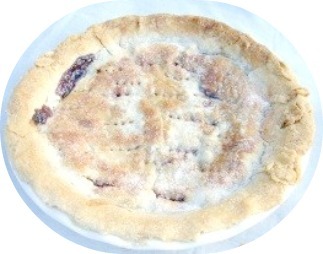 Place pie in a preheated oven 400F. and bake 50-55 minutes until pie is bubbly and crust is golden brown. Carefully remove from oven and let hot pie sit 15 minutes before serving. Pie may be served hot or cold. It is excellent served with thawed whipped cream topping, vanilla or chocolate ice cream. Note: The Blueberry Pie will become thicker as it cools.